We're here again with another MFT Color Challenge! Join us as we create with this sweet color combination. This challenge features cool colors to inspire you — Lavender Fields, Summer Splash, Green Room, and Sweet Tooth. 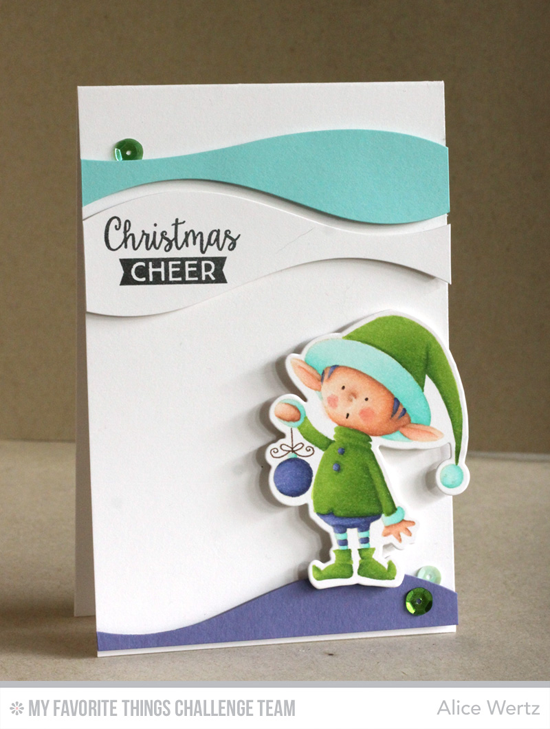 Alice colors up a cute elf from the Santa's Elves stamp set as a result of this color combination. I love how she uses the Snow Drifts Cover-Up Die-namics to accent her design. 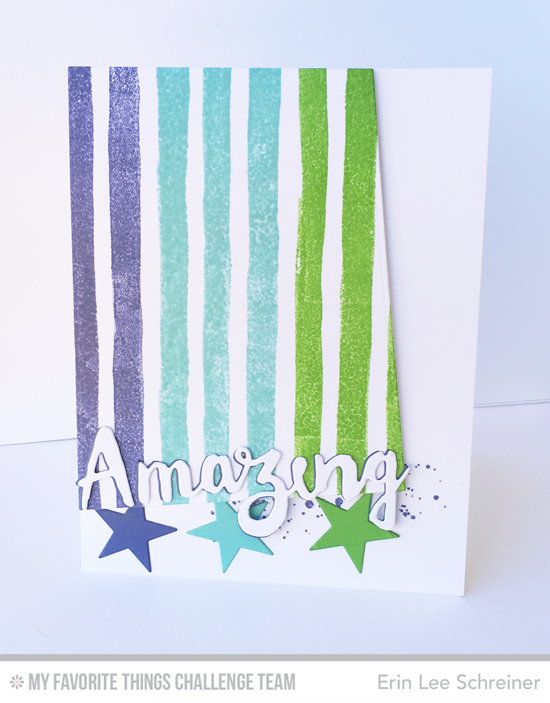 Erin Lee creates an absolutely lovely effect with the brand new Watercolor Stripes Background stamp with the cool colors of MFT Color Challenge 35. I love the slant, the white Amazing, and the colorful stars. Score! 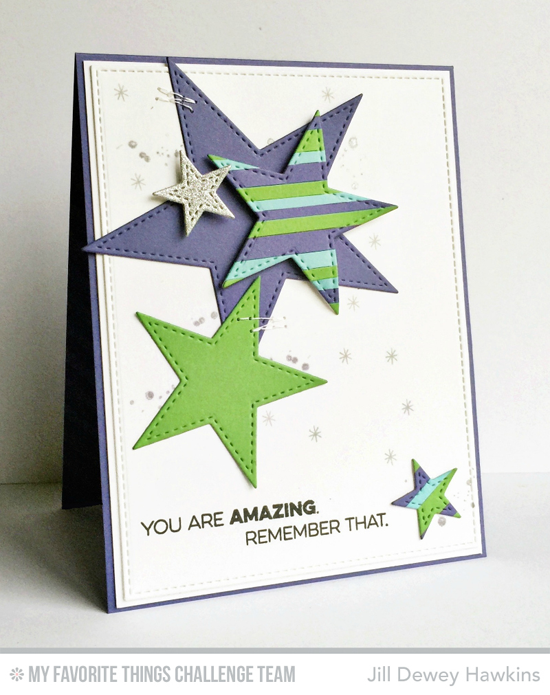 You don't often think of purple and green stars, but they look great when Jill creates a constellation using the Stitched Star STAX. Probably my favorite part of her design is how she arranges and layers the stars in a jaunty fashion. Miriam creates an eye-catching backdrop with the three cool colors of the combination and makes her sentiment shine in black and white. Bold stripes call for a bold sentiment, and the large Amazing from the Doubly Amazing Die-namics paired with the white on black sentiment from the Amazing stamp set are the perfect choice. 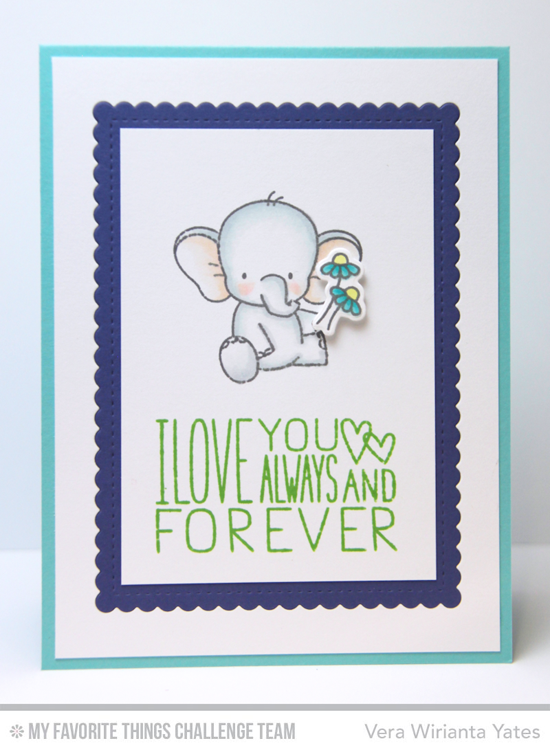 Vera's design is all sorts of sweetness as she features a cutie pie elephant from the brand new Adorable Elephants stamp set. The colors of this combo go well with elephant gray, don't you think? Veronica uses the cool colors for MFT Color Challenge 35 to create a pretty wintry scene using the Birthday Bears stamp set and Die-namics and the Joyous Christmas Sentiments stamp set. The subtle watercolor background and sparkly snowflakes are perfection! Congratulations, Bunny's Cards! You are the randomly selected winner of the MFT Color Challenge. You can view all the entries from the last challenge HERE. You have until Wednesday, December 23rd, at noon EST to add your link and be eligible for the prize of up to $20 in MFT Cash. Winners are chosen at random, so everyone has a chance! The prize is a $15 Gift Voucher to My Favorite Things, but if you use MFT stamps and/or dies in your project, you’ll receive an extra $5.